On Mondays, Wednesdays, and Fridays when I’m not blogging over on Real Simple magazine’s website, my counterpart Holly from decor8 graces the community with her insights into the design world. Last week, she wrote about Tiramolla Loft Bedrooms, and I was awestruck. Thank you, Holly, for the great post! All images are from the Tumidei website. The trouble with these, is that they require higher ceilings than one would get with some spaces. Still, I think these are pretty darned cool. Really inspiring, indeed! Thank you! Looks good, but what about the area under the far corners of the platforms? Do you go crawling back there like a coal miner to access storage space, or is it just wasted? They look cool but I don’t think they’re all that in the space-utilization game. Wow – those are so cool! Looks like it would be something good for the teenager set or maybe college. I agree with the previous comment – you’d have to have just the right space i.e. ceiling height for it to work. These are great! I checked out the website and saw that their products are distributed in canada and u.s. Does anyone know what stores carry their products in Canada? The far corners are probably wasted, but currently the top corners of most rooms are wasted and this makes those more reachable, so its not much different. You wouldn’t need much more ceiling height. It looks like the tallest platform is about 4 feet, and you don’t have to have a full 8 feet above that (so cozy!) so I’m thinking maybe an 11 foot ceiling max. I think these should be the next dorm rooms because you do have to have just the right space and just the right furniture, so if the rooms are designed for it and permanently furnished, that’s not a problem. And dorms generally don’t have more than one window, so you’re free to go up the other three walls. Look great, but very tiny. Look like they are built for kids. These are so awesome. We waste so much vertical space in our homes these days. I bet we’d be fine with smaller square footage if our rooms were designed this way. Although these are very cool— does no one ever print anything? Where are the printers or where would they be located in the office space? So often when I am looking at photos of or suggestions for setting up an office space, the space needed for a printer is not included. Since this can be one of the larger and necessary items in an office– it becomes frustrating. These would be perfect for our house! Relatively small rooms and high ceilings. And I’ll be kids love having their own little structure. I know I would have. I would be nervous to sleep on a bed that resides under a desk and drawers as in the 3rd picture. 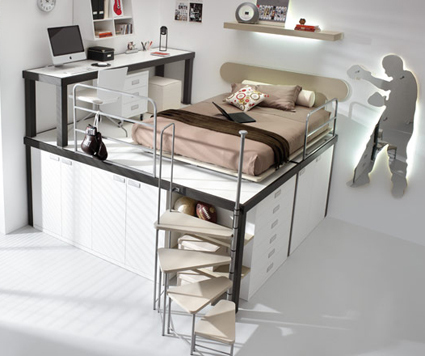 I like the idea of pulling out a trundle bed from under the study platform, as in the bottom photo. Bunkbeds are great, but making the top bunk is such a pain. Now I have to imagine these in our traditional-style house with crown molding and baseboards. I think the bed in the third picture is meant to be pulled out. At least I hope so. It looks like there’s not much space down there. Seems like it would be akin to sleeping in a coffin. Printer’s in the closet, where mine stays, in a drawer, or behind a sliding door. Electronic mailing and file storage means that I pull out the printer about once a week. Those mattresses look great–are they vinyl or pleather? Much better than cloth for reducing mildew and dust mites. I very much want a setup like this for my room. I’m particularly in love with the blue one. Why NOT size this up for grown folk? At the very least, I agree that dorm rooms of the future should borrow some of these design ideas. They’re gorgeous! Most of us don’t have cathedral ceilings in every room of our house/apartment/condo. But for those few that do, these could provide inspiration. 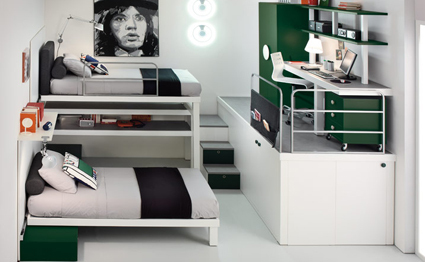 Love the modern, streamlined look, but O could NOT sleep on beds like that! If they made something that could accommodate a Stearns & Foster pillowtop, THEN we’re talking! I simply love the idea! THIS is exactly what I’m looking for in a room, since I absolutely love cozy spaces but hate how there is never enough room for my stuff. Sure, it does require higher than normal ceilings, but other than that, I fell in love with the design immediately. Anyone know where you go to buy these items? And, are they available online? @Bill — I would e-mail the company at [email protected] and ask where the products can be purchased in the U.S. Their website says that they are sold here. So am I the only one who saw this type of thing is use in college? Maybe because I went to an engineering school? Several dorm rooms had “two floors.” There was a small space of “normal” room that served as a vestibule – just enough room for the door to swing open. Then about 4.5 feet off the ground, there was a fully supported floor system built by previous occupants. The “lower” floor was divided into two “rooms” just big enough for each roommate to sleep on a twin bed with a lamp and a table. I guess they could do some studying and hanging out down there. The “rooms” were made private by a curtain. But the top floor was the living room – TV, computer, frig, sofa, whatever the two roommates wanted. It was pretty smart but some who genuinely suffered from claustrophobia wouldn’t have been able to live there. i love the last pic its totally cool! Does anyone know where i can purchase one? i really would like one of these. If it helps any, I emailed and they said that they are available in Roche Bobois stores. There are 30 or more in the US. Not sure about anywhere else. I very much want a setup like this for my room. Wow! Very stylish. Nice solution if you don’t have very much space. great, i really want one. i am s teenager amd think it would look amazing in my bedroom the problem is im from england and so live in england. where can i get one??? abyone know??? I sent an email to them asking about pricing, shipping, and everything else required to get one of these, and I am still waiting for a response! Why don’t they make things like these in America this cool?